**I realize the chances of success here but I lost a Wonderwoman pin on Sunday's hike. It has a lot of emotional value and shouldn't be polluting the beautiful mountains. Please comment if found! To get right to the point, Potash is a great little climb! It's 4.4 miles roundtrip and covers about 1500 ft of elevation gain (give or take depending on the source) through open hardwoods and later, semi-open conifers. After strolling up the hill from the parking area, we began the hike with ease. The trail was flat and moderately curvy in an enchanting way. About .4 mi in is the infamous water crossing. My understanding is there is some sort of workaround but I was relieved that it was completely passable via a sturdy snow bridge. Beyond the crossing, the trail continued rather leisurely, rolling along as we slowly gained elevation. begging to be broken out! The trees transitioned to conifers and we started experiencing steeper inclines. They began to outnumber the flat ones and I was happy I had both televators on my snowshoes and foster pup Sage pulling me along! Perhaps a quarter mile or so below the summit (guessing) we encountered the one narrow ledge I'd read about awhile ago and Sage quickly realized staying on the trail is wise. Back into the woods, the "ups" and flats alternated until we reached what I'm assuming is ledges. The wintertime translation was open spaces with sporadic, shorter trees, and the first vistas of the hike. Life on the dangerous side! It is steeper than it looks! A little further up we went before reaching the summit. It's a beautiful area, enough room for a few hikers to spread out without trampling anything fragile (in non-snow covered months). I've never hiked anywhere that gave me a view of the Kanc heading west and I found that very intriguing. The view swept west and pretty far north as well, with Washington the last visible peak before the trees. I tried to use my new peak identification app but missed a necessary download... next time! Despite my best efforts (I really wanted to enjoy the atmosphere during the descent! ), we jogged until the grade nearly reached zero. I'm pretty easy to please when we're in the mountains so, of course, I hike the dog's hike. About 40 minutes later, we were at the car, finished too soon, but still grinning ear to ear. 30's, no wind, and lots of smiles. The trail is beautifully broken out, thank you to those before us! 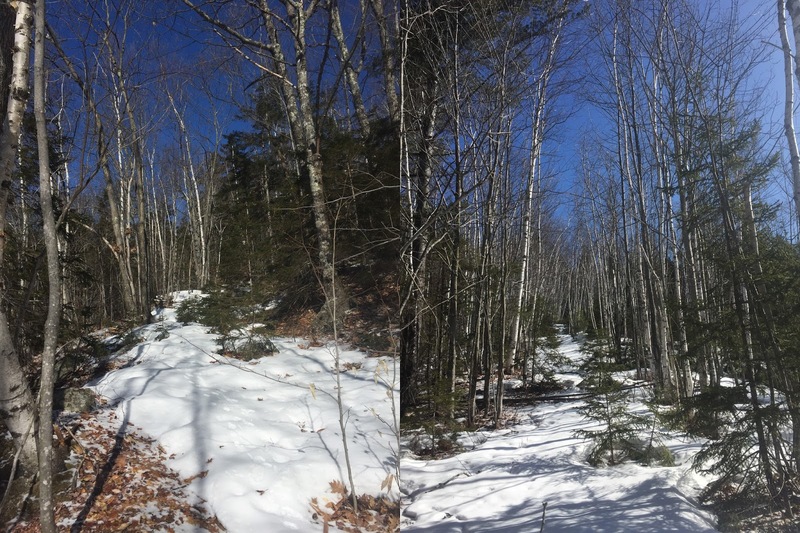 We couldn't have asked for better weather for our last winter hike of the season and it really highlighted the beauty of the woods. The open hardwoods present for the first part of the hike allowed the light to pour in and keep me warm before exertion took care of that. I'm easily mystified and the road crossing piqued my interest, as did the variety of animal tracks we found. Into the pines, the noontime light gleamed on the pine needles in the most beautiful way my photography skills can't do justice to. Though plenty steep to offer a good, albeit short, challenge, Potash was an immensely enjoyable hike. We did it in about 2hr10min but could've slowed down to enjoy more of the mountain's charisma or, if we were ambitious, hopped over to visit Hedgehog. But alas, I had "grown up commitments" to tend to so we headed home. I often like to do a lot of recon before a hike. Other times I do a bit but sort of wing it, usually in places I'm somewhat familiar. Today (now yesterday) was a totally winging it kind of day as Amy and I met up with the dogs, initially to be disappointed with the parking options at the base of our originally planned hike. 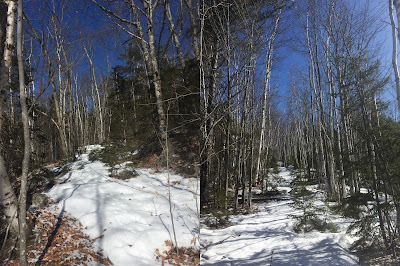 After quickly reviewing alternatives, we traveled down Rt 16 to Scott Road in Tamworth with the intention of heading up Hammond Trail, hopefully at least to the Jim Liberty Cabin. While warmer temperatures and lower winds were in the afternoon forecast, at 9:00AM, it was still in the single digits with some cold gusts so neither of us necessarily had our hearts set on a summit but I was hoping for some sort of closure for Ty - the cabin, a ledge, something that would give her a good turnaround point (because she is a true peakbagger and is very expressive about turning around for what she considers "no reason")! The lot is small and thankfully we were the only ones there. From the start, micros were absolutely perfect for the entirety of the hike. The ground was generally hard packed snow. Perhaps there wasn't a lot of traffic on this trail throughout the winter because it is almost level with the melting around it - no monorail. Plenty of spots were down to the leaves with only a dusting on top as well. Within a half mile or so, the trail crossed a brook twice, the second of the crossings being a little difficult for the dogs because the few rocks available for hopping were coated in glassy ice. For once, we humans had the advantage! Another quarter mile later, as we began ascending a gentle hill, the trail was intersected by what I thought at the time was a carriage road. Upon returning home and doing some research, it appears to have been a logging road, which I find interesting because I didn't see the evidence of logging I'm accustomed to and it shared characteristics with the few carriage roads turned trails we've hiked. That being said, many of my experiences with logging roads involve recent harvesting and that particular road could be much, much older. For example, Lincoln Woods was logged heavily from my understanding and it's unnoticeable to me. At that point, half the dogs were migrating up the road instead of the marked Hammond Trail. In light of their enthusiasm and knowing it'd be better footing and consistent grade for Tango, who is about to start PT, we decided to follow them. Anyone a critter expert and know what happened here?! Body Warmer Hurtta was kind enough to send to us! The logging road followed the river high along a ridge for awhile and predominantly through hardwoods that creaked in the cold, throwing me off on more than one occasion. Despite the mellow grade, we gained some appreciable elevation as it wound up the mountainside, something that became very apparent as the wind hit us more powerfully! Eventually, the road dwindled to nothing and we explored some possible tributaries before heading back. Back at the car. Everyone looked so darn cute! It was a view-less and lovely day wandering that old road and not something I normally do. But I'm glad we were spontaneous. The dogs had a great day and it was fun catching up with Amy, who was kind enough to humor us with our variety of sometimes conflicting canine needs throughout the morning. While this post falls short in the trail reporting sense, may it encourage you to try new things while the trails are in great shape! Super progress for our shy foster lady!